Lawns are now the number one irrigated crop in the U.S., covering over 40 million acres, three times the land area covered by corn and more than wheat. That is a pretty startling fact. We have gone from a nation of growing food crops to ornamental grass. The statistics on water use, maintenance costs and materials, fertilizer, and other resources for lawn care in this country is even more astounding. From a wildlife perspective, the lawn is a barren wasteland- a monoculture that supports very little insect and animal life. The only animals and insects that do use the lawn are referred to as pests, and most are invasive, or non-native, and people in the U.S. spend millions annually to control them. Certainly, deer, robins and some other wildlife species will feed in or on a lawn, but the reason is often that there is little else left for them. 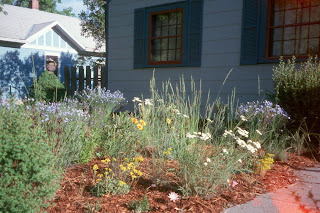 Removing all or part of your lawn and converting it anything else is one of the best things you can do for sustainable landscaping, increasing biodiversity, and fostering wildlife in your garden. The smaller your lawn, the less stuff you will need to maintain it- we get by with a small reel mower, that takes up little space, is quiet, does not need fuel, is inexpensive (compared to a gas-powered lawn mower) and is fun to use. A lawn has its place in a yard- it is useful for a wide variety of activities, but it probably does not need to cover the amount of square footage as it currently does. We have some small lawn patches in our yard (see photo below), and they center on dining and entertaining areas, and though they are remarkably small, they can accommodate a lot of people. Also, the lawn patches are in areas of the yard that receive shade, so even though we do not water them grass grows pretty well. We have removed all the lawn from areas that receive full sun, or were otherwise difficult to grow turf grass. Examine your own yard and think of how little you could live with, and consider lawn as a luxury, indeed it is. a lawn once (and still is) a status symbol,for the aristocrats who could afford to have servants care and maintain it. Turf grass grew easily in the English climate of moderate temperatures and frequent rains. If you live in a climate that can't support a lawn without irrigation, consider the environmental effects of irrigating. Is that the best use for water? Removing a lawn and keeping it away is not that simple, but not that difficult either. It takes care, prep work and patience. It can be done without herbicides or with a very limited amount of herbicides, or with a lot of herbicide if you are so inclined (though I am not). Below are several steps to ensure sucess. Step one, cut a hole in the lawn (kidding). Step one- Rent a sod cutter. If you have an area >100 square feet, I strongly recommend a gas powered sod cutter, if the area is smaller, you can get by with a kick style, manual sod cutter. The reason for using a sod cutter rather than a shovel is that a sod cutter removes the sod just below the rooting depth of the grass and removes very little- just a thin veneer of- soil. This saves (literally) tons of soil. Also, by using a sod cutter the sod is reusable (see below). Whereas if you were to just dig up the sod one shovel-full at a time, it is in a less desirable state for reuse. If you are really determined to use a shovel, use a square-bladed shovel and aim to just skim the sod layer off, as opposed to digging straight down. Mark the area of sod you want to remove. 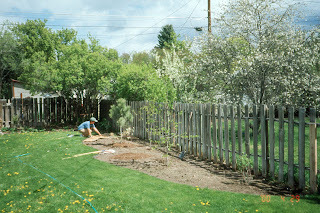 Once it is marked, think about it for a few days, and probably increase the size of the new garden bed. I have never heard anyone say "I wish my garden beds were smaller", or "I sure miss mowing that part of the lawn over there." So remove more lawn than you think you will need, you will be happy you did. Cut and roll up the lawn, and get it away. This is a very satisfying step- instant gratification. A couple of notes here- do not try to “solarize”, cover, smother, or spray herbicide to kill the lawn. These methods take too long to be effective (if they are ever is effective at all). It just takes a small bit of grass root left behind for the lawn to come back. I am sure there are some situations where it may work, but I do not recommend it. In our climate, the lawn does not really ever die from covering it, maybe after a few years, but who really wants to spend that long. I suspect even after a few years, once it gets some rain, it will re-grow. Still if you do manage to kill it (either with herbicide or from covering it), then you still have to deal with the sod that is there- it is not like the lawn will just decompose to soil. 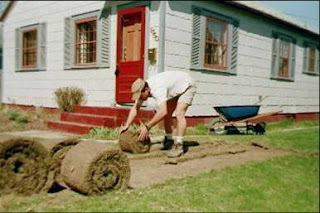 Once you have cut and removed the sod the best thing to do is to get rid of the lawn. I have tried composting it, turning it over, etc… It takes a really long time to break down and consumes a lot of space in the process. Even if you keep it in a covered pile, there is always the possibility it will start to re-grow. People want sod and my advice is to give it to them. The best thing to do is…put a "free" ad in the newspaper (so 1990’s) or Craigslist (so 2008) or MySpace (so 2009 if you under 30). People love sod, and it will be gone before you know it. Install lawn edging to keep adjacent lawn from getting into beds (if applicable). Use the largest edging you can find (at least 5-6”). Then, plant your plants- the fun part. Depending on your garden plan, I recommend adding a layer of some sort of weed mat depending on your garden plan. We like to use newspaper, or cardboard. 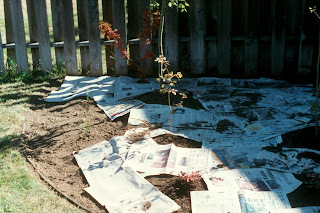 When you lay down newspaper use several overlapping sheets and wet it with a hose to help conform to the contours of the landscape. The thing with newspaper that I like is that it will be around for a few years while things get established, but eventually it will decompose. Landscape fabric is more or less forever but it could be really useful in an area when you do not want any plants to grow (we have some under our clothesline). Finally, mulch heavily! Don’t skimp on mulch- go for an initial 4-6” application of some sort of mulch. Mulch is a really important step; mulch limits weed growth, retains soil moisture and eventually will break down (this can be good, depending on what your plan is). Some people have concerns about mulch, in particular cedar bark, acidifying he soil. I have not found this to be the case, and maybe that is due to our dry climate, but it does decompose in a few years in our yard. In our front yard prairie, we initially added a lot of mulch (see photo above), but this broke down and now you’d be hard pressed to find any (a good thing, see photo below). Mulch is critical for the first year or so to get plants established (even xeric species), and keep out weeds. Even though we chose native, drought tolerant plants, you have to plan on one season or a year (depending on when you plant stuff) in order to get plants established (that means watering and weeding), beyond that, we have not found a need to water. Mulch really limits the amount of time you will spend weeding. Although there are many options for mulch, I recommend shredded cedar bark. This is a lumber by-product, and because it is shredded, it stays where you put it. Cedar (western red, in this case) takes longer to decompose than many hardwood mulches. In many cities, you can get free mulch from tree removal services or city arborists that chip and shred trees. In general, this sort of mulch is pretty low quality, filled with a lot of leaves, and small particles. It breaks down quickly (may blow away in a wind storm) and compresses really quickly, but for the right application, it is usually free (a great price) and it is a great use for local materials. We have rented a chipper/ shredder to grind up some shrubs and trees and used that mulch as a base layer, on to which we added shredded, cedar bark mulch. This is a good use for free, low-quality mulch. WHAT A PARADISE THIS BLOG I'LL START COMING! Ha, good for you! What a great post. I'll point to that when we're getting closer to our Native Garden tour and there's some hope people might read it. I agree with you completely about getting rid of the lawn. I've turned mine into a mini-prairie, with a "lawn" of buffalo grass and blue grama. One word of note, however: removing the sod doesn't work if you have a persistent perennial lawn grass like Bermuda grass. In this case, the only way to get rid of the lawn is through herbicides or solarization--plus about a year of waiting to be sure it's really gone. the less the better! I have a teeny little lawn left because i love gardens more. the only reason i have any is to set off the edge and shapes of the beds and for a place to sit. thanks for following my blog. Good job on yours. I think it is really nice. Thanks for the post! We love our lawn, but with all this NW moisture it's getting replaced by moss, and you can't beat the moss, he is the winner. So, I try to gradually replace the lawn by native plants. They look good even if there is some moss there. I live in northern California and all the agencies and utilities preach about removing the lawn but NOBODY actually described HOW!! I've been to soooo many California-specific websites, but none have been as informative as yours. The suggestion regarding using newspaper or cardboard as a weed preventer is BRILLIANT! THANK YOU!! Can you describe any irrigation that you've added? We may need to add a drip or microspray system, but again I've never seen anything specific as to how to lay it out. I've bookmarked your site and will check back often. Do you water the small amount of lawn you have, or did you find a lawn that does not need water? That is a good question- we don't water our remanat lawn patches- and they are nothing special, species-wise. Our little patches of lawn are only in areas that get some shade either from the house (on the north side), or by the garage (on the east side of the garage). Because of the shade, the lawn stays pretty green through the growning season. I also cut it pretty frequently and apply compost in the spring and fall. This is a great article. I applaud your efforts to reduce your lawn. We have used tree trimmers' mulch for years with great success--blowing away has never been a problem. In the summers it does include leaves, but they are intermixed with wood chips. We listen for chippers in the neighborhood, seek out the trimmers, and ask for their load. They are happy to dump it on our property to save a trip to the dump and the dumping fee. It is the most sustainable product on many levels. I have photos and articles of our mulching experiences on my website. I'm not familiar with the methods for producing cedar bark, but the problem with cypress mulch, the most common offering here in Florida, is that whole virgin cypress forests are being chopped down to supply the demand. This is not sustainable. Thanks for the comments. Good point about cypress mulch- it is not sustainably produced and I don't recommend people use it. It is not readily available here, so I forget about it sometimes. Shredded cedar bark much here is made from the bark of western red cedar trees, harvested for lumber- it is a byproduct, and the trees are not harvested for their bark alone. Around here cedar comes from western Montana and northern Idaho, so it is local as well. As far as hardwood mulches, I am glad those are working for you. Your success might be a function of being in Florida- it rains there! Here, the chipped wood and leaves dry up quickly, and can blow around, and they do break down fast. thanks so much! This takes the scariness & guesswork out of lawn removal & replacement! A very practical guide! Have you had any experience with Buffalo Grass? I tried the UCVerde Buffalo grass in my backyard, and the opportunistic weeds, crabgrass are gradually beating it out. Dear lord... I need to remove 350 ft2 of lawn to make room for flower beds, and as my budget is absolutely $0.00, I will need to do it by hand. Your entry scares me, as it looks like back-breaking work, but on the other hand you also make it seem possible if I just take my time and spend a couple of months on it. Thanks for the great inspiration and tips! Is removing a lawn with a sod cutter something that can be done with relative ease or does it require 'putting you back into it'? I have strength issues and my husband has some back issues, but we really want our front lawn reduced. Great post... I hate lawns since they are a status symbol and I live in an area full of grass-seed fields that could be used for growing food or biomass. I'll use your tips to take mine out. I appreciated your very informative post. I was feeling overwhelmed and unsure how to tackle the removal of my ratty, water-guzzling lawn, but thanks to your tips, I'm inspired and ready to 'get at it' - thank you! Wonderful! Thanks so much for the comments- I am really glad this was helpful. Stop back and let me know how it goes! Weighing in again: I am really grateful I have not mowed for over ten years. When I consider spending weekends sweating and mowing and watering and weedfeeding I think my time was so wasted on weekends, like a Sisyphean treadmill in suburbia. Now what grass I have grows long and lays over. I don't own a lawnmower. I occasionally weedeat a very small area in 15 minutes. Everything has gone to meadow or forest floor, and it has a remarkable beauty. Wilflowers are rampant and increase every year. I must say, it has taken a number of years to arrive at this philosophy, plus a truly beautiful wooded acre of land to teach me the verity of stewardship. I am the steward of my land.